As a result of new industry research, the magazine and book category is now armed with deep-dive insights about shopper behaviors and preferences — as well as engagement- and sales-driving display prototypes that can be adapted for the needs of specific retailers. Last fall, MBR retained retail experience agency Miller Zell to conduct the shopper research, which also included their reactions to visual display concepts, for both the mass merchandiser and food retailer classes of trade. At the 2018 MBR Conference, Lise Wilson, VP, retail strategy, Miller Zell, summarized the findings, including the “winning” display concept attributes and prototypes that channel partners can now introduce to retailers for potential introduction during store resets or for new publications departments. “The research very much confirmed that consumers have passion for the publications category, enjoy browsing, appreciate a well-planned, inviting department, and give credit to retailers who offer such departments,” sums up MBR president Jerry Lynch. Highlights are presented here. The full slide deck and audio are available on the MBR site. The three-phase research began with an online survey of 1,000 consumers who reported having shopped for magazines and books in the past 12 months, or said they would consider shopping for them in the next six months. The respondent pool spanned ages 18 to 71, and matched the U.S. general population in ethnicity. Millennials were over-sampled to enable an in-depth analysis of their publications reading and shopping habits. Two groups were broken out, with one answering questions on books, the other on magazines, to enable delving into each subcategory. The survey probed reading, browsing and shopping habits, opinions about publications displays and assortments, plus reactions to visual representations of various ways that the publications department or aisle might look, and how that might influence their overall perception of a retailer. • While consumers primarily seek information on topics of interest from magazines, shopping the publications area is also viewed as a “break” from shopping for necessities, or a reward. Publications shopping is more likely to be a planned part of the trip in mass merchandisers than in grocery stores. 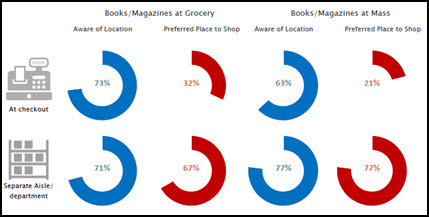 *Consumers tend to visit grocery stores more frequently than other types of retail stores, and so tend to cite convenience as the key reason they buy magazines and books at grocery stores. At mass, convenience is still the primary driver, but attractive pricing, and selection are also key factors. • Among those who haven’t recently purchased publications at grocery, selection is cited as the biggest hurdle for books (52%), and the second-biggest hurdle for magazines (22%). The top magazine hurdle is “buy/read elsewhere” (28%). Among those who haven’t recently purchased publications in mass retailers, “buy/read elsewhere” is the most-cited hurdle for both books (49%) and magazines (40%) — but the consumers often tie this back to limited selection. • In addition to wanting a large selection of the latest titles, consumers value presentation. They want “easy-to-see titles and covers” in a “well-organized” aisle or department. • Most also prefer to shop the separate, in-aisle department that affords a larger selection and organization by subject, over the checkout selection. • At grocery, publications shoppers most expect to find the department near greeting cards and stationery. At mass, they also expect to find magazines near cards and stationery, and books in the rear, in the entertainment department. In both types of stores, most indicated that they could find magazines and books with relative ease, because they know their way around the store. Some look for overhead signs or look at the products in the aisles to find publications. • Shoppers are fairly interested in ordering books or magazines through grocery or mass stores. About four in 10 show interest in ordering them through their grocers. Millennials, larger households and more frequent readers are most open to the idea. • Shoppers express moderate interest in seeing books and magazines in areas of the store in addition to checkouts and mainline displays. For instance, at grocery, about one-quarter each said they would find it “extremely appealing” to have publications outposted in wine, cooking and health products aisles, with just slightly lower percentages at mass. Millennials and women show higher interest in outposting. • Millennials’ attitudes and behaviors in regard to magazines and books are very similar to older consumers’, for the most part. Phase two gathered shoppers’ reactions to visuals showing a minimal (control) in-aisle display of publications, versus enhanced concepts. The comparison focused on the grocery-store environment used a control display showing only standard signs for magazines and books over the products. 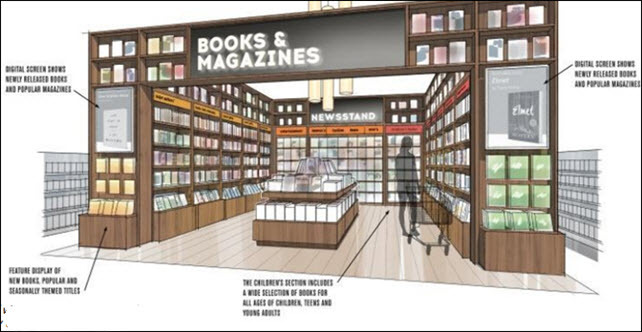 The enhanced concepts incorporated some of the key factors for a strong presentation identified by shoppers in phase 1: space to move around in the aisle, large assortment, and easy-to-see titles and covers. 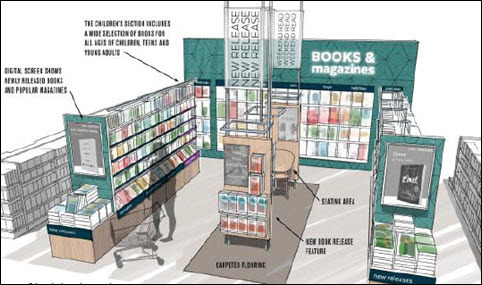 Concept 1 included the addition of in-aisle organizational signage; Concept 2 included organizational signage plus end caps promoting new releases and current issues; and Concept 3 included those two elements plus large, overhanging “wayfinding” signage drawing attention to the department’s location. • All three test concepts performed significantly better than the control. • Department organization—especially creating sections by subject—drives the appeal of the updated concepts over the control. 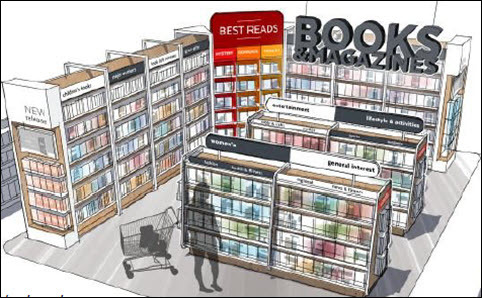 Turning to mass merchandisers, the research tested shoppers’ reactions to a control concept basic shelf-level signage delineating types of books and subject categories for magazines) versus three enhanced concepts. • More than half of shoppers said they’d be more likely to visit a mass retailer based on an upgraded Concept 1 or 3 magazine/book department. Magazine shoppers are particularly likely to be drawn to mass stores by a more appealing publications department. 1. Seeing the shelves organized with signage that indicates that similar titles are grouped together to help you find areas of interest. 2. Seeing in-aisle signs that indicate current book and magazine sale pricing/special promotions. 3. Seeing specially-lit shelves and/or department-specific lighting that’s bright and comfortable. • To adapt the learnings from the earlier phases to a particular retail environment so that shoppers will perceive the department or aisle as a distinct upgrade in comparison to their expectations, but also a good fit with the individual retail store. • To develop prototype concepts to determine how shoppers at a specific supermarket would respond to a new type of book and magazine department. The team developed concepts to test with focus group participants who shopped recently and frequently at Retailer X, and have purchased books and/or magazines within past 12 months or are likely to purchase within next six months. The participants spanned Millennials, Gen X’ers and Baby Boomers. Many participants said that the store isn’t offering the products and experience they want, and many expressed unhappiness about a reduction in the size and assortments of publications areas. “It’s no longer the highlight — and reward — of grocery shopping, because the books always seem to be the same." On the positive side, regarding new concepts, shoppers responded to curved, “organic” elements that felt welcoming and presented curated assortments (“fresh ideas”) that sparked as sense of inspiration. They also responded to end caps and overhanging departmental signage. These serve as beacon elements that give the department a sense of intention and purpose, conveying that the section is not just an “afterthought” for the retailer. All concepts emphasized organization of assortments, providing shoppers with signage to help them identify specific subject areas, and locate new releases or special promotions easily. new releases and limited-time promotions. There are many shoppers who value the experience of shopping for books and magazines at retail. • Although they like to find magazines in the checkout aisle, they want to be able to visit a dedicated book and magazine aisle or department – for both books and magazines. • Browsing is time well spent. Shoppers don’t always know what they want, but they enjoy seeing what’s new and interesting and discovering new publications. • Retailers who are willing to help them on a “journey of discovery” – even if brief – stand to gain both in terms of product sold and trip frequency. • The experience matters—particularly to Millennials. Millennials are avid shoppers who appreciate a thoughtful presentations. They’re more open to multiple placements of books and magazines. 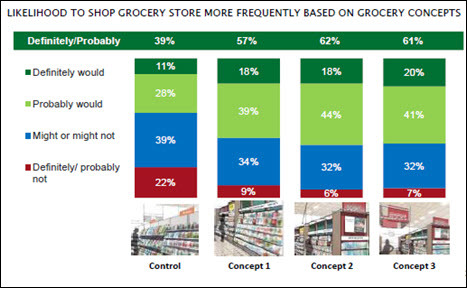 They’re also more likely to prefer a store-within-a-store type of department within mass merchandisers, and a more distinct aisle presentation at grocery. • Shoppers want to feel that the book and magazine department matters to the retailers they visit. They want the section to feel well-planned and valued not an afterthought. They have responded to reduction in prominent presentation for the category some retail stores by adjusting their expectations for assortment and variety downward — leading to fewer visits to the department.